You saw from my Alternative Milk Guide that these non-dairy beverages are basically nuts/seeds/grains pureed with water and strained. Although Mr. Picky drinks raw milk regularly, the rest of us don’t and the non-dairy milk that is used most often in our house is almond milk. Once I learned how easy it is to make your own extremely delicious, pure almond milk, I have never purchased it off the shelf again. This is a great, non-messy activity to do with your kids since they can help with the process and it is also really cool for them to see how almonds become almond milk. It was also really cool for my husband to see how to “milk” an almond because he was having a tough time visualizing it. 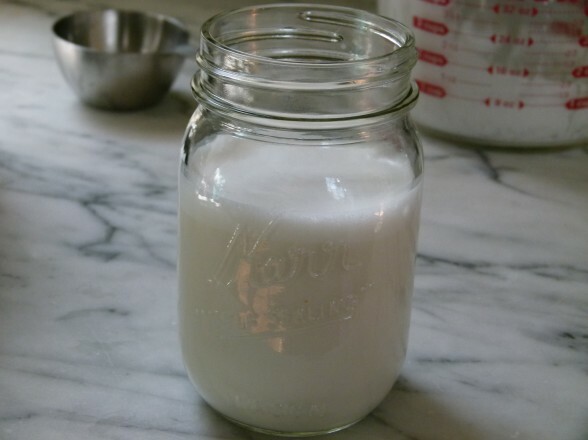 I made a basic almond milk from almonds and water the first time around and it was the kind I was familiar with. But then my friends Baelyn and Shiva told me about The Mylk Man in Venice, California who makes and delivers fresh organic almond milk made from almonds and coconut water. Genius! Lastly, my friends at Pressed Juicery in Brentwood make an unbelievable almond milk from almonds, dates, vanilla, sea salt and water. I had to give both of these a try at home since I’m not always in the city and voila! Amazing! We met our friends Jane, Matt and their daughters for dinner the other night at our local YMCA tennis club and Matt happened to mention that he is recently dairy-free and has discovered the joys of almond milk. Where most couples might go out for an after-dinner drink, I knew where we were going — back to our house for an almond milk taste testing! Everyone was blown away by the coconut water and date-sweetened versions. 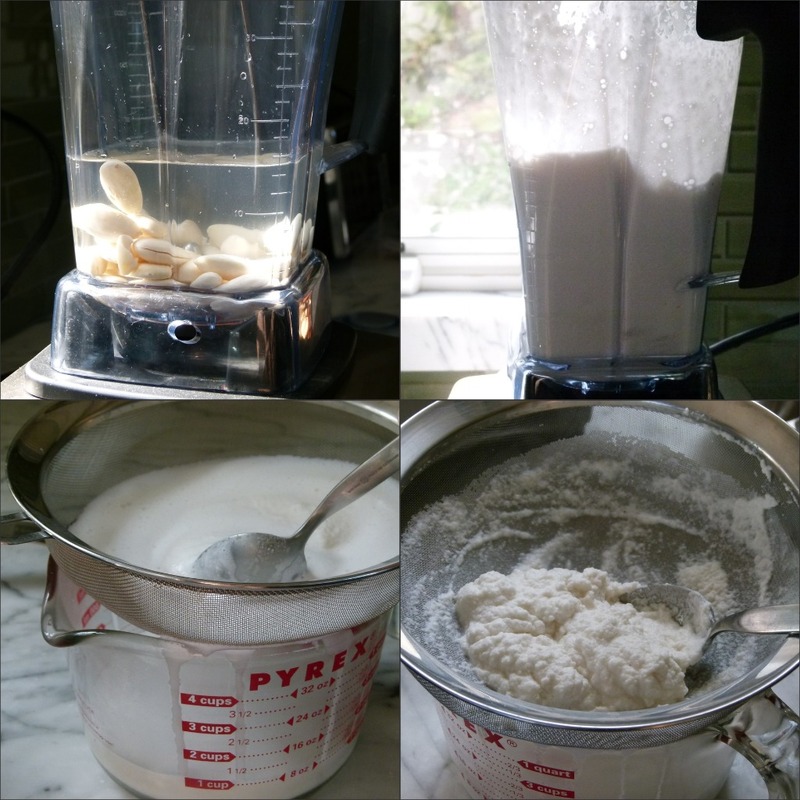 We even figured out what to do with the almond pulp I had saved from straining the milk. Drinks and dessert! Drain the almonds in a colander and rinse with fresh water. 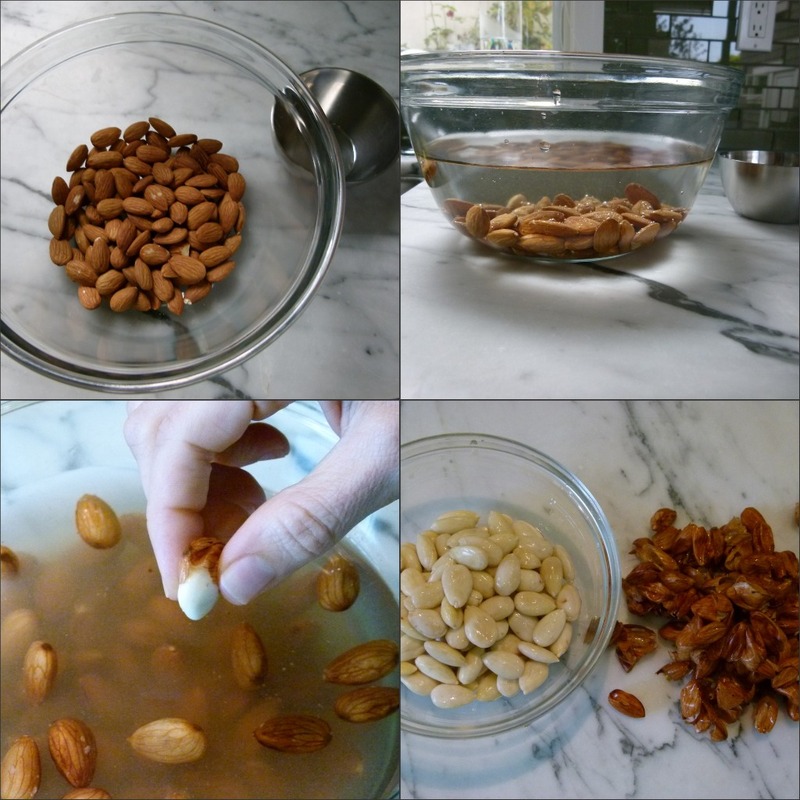 Remove the skins from the almonds by pressing them through your thumb and forefinger. Discard the skins and place the almonds in a blender or Vitamix. Add 3 cups fresh water and blend until the nuts are pulverized. Strain through a fine mesh sieve, cheesecloth or a nut milk bag into a glass bowl. If using a sieve, use a spoon to scrape the almond meal around and allow as much liquid to drain through. Transfer to a glass jar and refrigerate, covered for up to 4 days. Add the remaining pulp, sweetened with honey or maple syrup, to hot cereal, granola or fruit. Soak almonds in regular water, but use coconut water to blend with the skinned almonds. Follow directions for basic almond milk, but blend skinned almonds with water and 8 pitted dates. 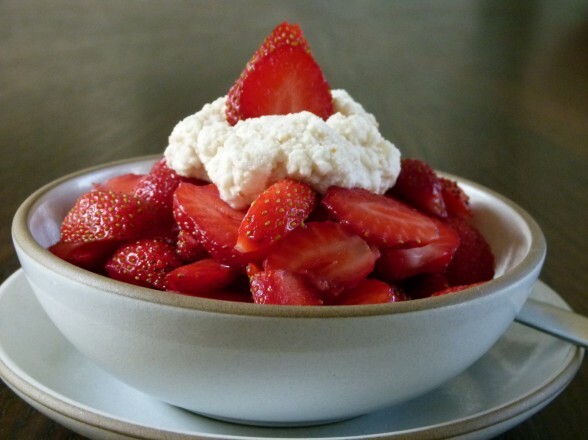 You can add a drop of vanilla and sea salt, if you like, but it is delicious just like this. You don’t need to sweeten the remaining pulp if you choose to eat it since it is already sweet from the dates. How do you store the pulp? Fridge?? And how long is that good for? Yes, in the fridge (or freezer). I have had in the fridge for up to a week. Hi! We usually make the version with dates, but wondering if there’s a way to get it a little thicker. I saw something online about bringing it to a near boil, but didn’t really work for me. Have you tried anything to thicken almond milk? Sure! You can try subbing in part raw cashews for some of the almonds and it will be thicker for sure. 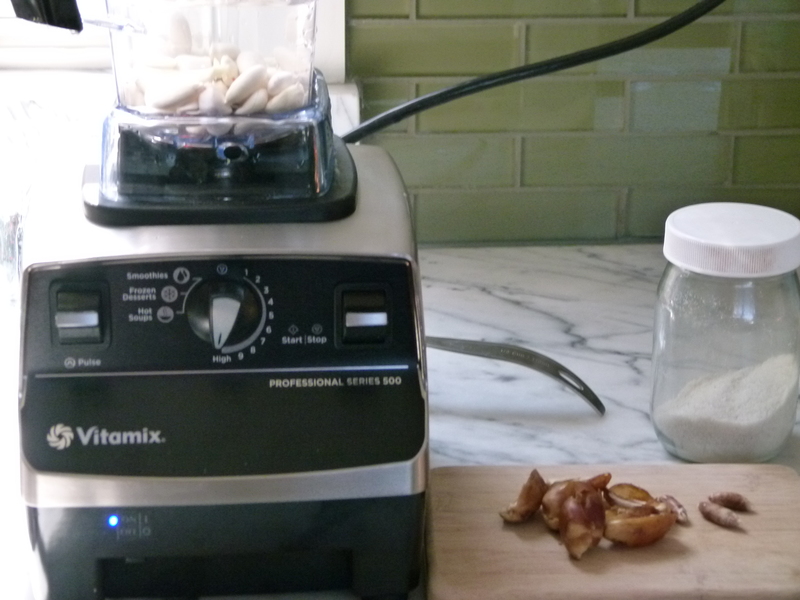 If you do not own a Vitamix would you recommend soaking dates over night to help soften the texture and blend better? Yes. I would just soak the dates along with the almonds. Or soak the dates in hot water for 30 minutes if they’re really hard. Have a batch of almond milk in the ice cream maker with some puréed organic peaches & nectarines that we couldn’t eat fast enough, along with a squeeze of lemon juice. I’ll let you know how it goes! Made my first batch this weekend. It tasted great. However, I found that when I bottled it, and placed it in the refrigerator, the milk settled, with the white frothy components floating on top and the clear liquid on the bottom. Is this normal? 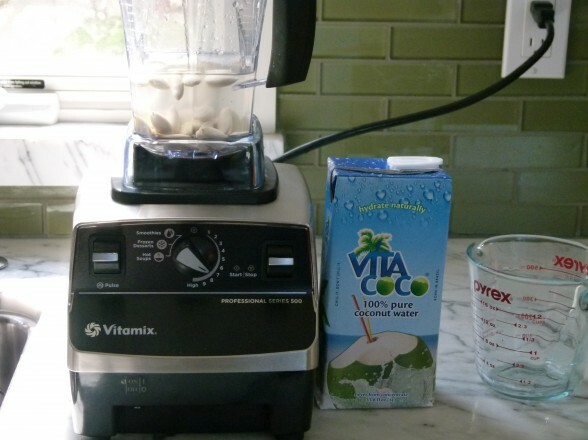 I have a really nice blender, and seriously blended the softened nuts with the coconut water. oh my, I just had a taste of this almond/fresh coconut milk and I could drink a gallon of it. It’s divine! Thanks, Chris! I make it every week! Thanks for joining the class yesterday, Kate. I’m pretty obsessed with kale pesto right now myself! Yes, I haven’t been skinning my almonds lately as I haven’t had a lot of time these days. I can’t detect any bitterness, so just go for it! Can you make your own coconut water? I go through a ton of almond milk and that’s just another ingredient that I’d be running out of! It will add significantly to my monthly grocery budget if I made the milk using coconut milk each time. I currently make it with blanched almonds, water, vanilla and a pinch of sea salt. It’s a little bland, but I normally use it in coffee and smoothies so it’s fine for that use. I would like my son to drink it but he doesn’t like it vs. cow’s milk (he’s 3.5 yrs old). I keep trying! Maybe mixing sweetener in will work. Dates may do the job. Or maybe making it with coconut water. Let me know your suggestion, thank you! I just made the almond date milk with the vanilla and salt- delicious! Better than a milk shake! How cool that you think so! We had a go at making the almond milk but had a lot of trouble removing the skins after soaking. They just did’t squeeze off as you suggested. So we gave up and threw them in whole. It seemed to work out fine. I didn’t have any cheesecloth so used a simple strainer. The result was a little gritty but I think with a cloth it would work out perfect, Is there a reason for removing skins? Do you know why mine may not have come off as easily?? Would blanched almonds work? We used the pulp for porridge (yum!) and in muffins (awesome!!). Great questions, Bonnie! A possible reason the skins didn’t slip off easily is if you didn’t soak the almonds long enough. If you soaked them for the recommended time and it still isn’t easy for you, soak the almonds in hot water for 5-10 minutes and that should work. You don’t need to remove the skins to make almond milk, but some people find the skins to be a little bitter which will affect the taste of the milk. Another option is using already blanched almonds, but definitely soak them since that helps to soften them and blend more easily. A strainer isn’t going to cut it if you want a smooth milk — cheesecloth, nut bag, fine mesh sieve or super-thin kitchen towel are your best bets. Oh, I hope you can! I wanted to ask you what kind of milk you recommend for a 3 year old if they don’t drink cow milk? My friend’s daughter seems to be allergic to soy milk (which isn’t great to be drinking every day anyway, correct?) and I told her I’d ask you what you’d recommend. I’m glad you asked! I am a big fan of raw milk since it is much more digestible and nutritious, in my opinion. But not everyone is comfortable with the idea of it, has access to it or can afford it (it is more expensive.) So if raw isn’t an option, I would have her try goat milk. It is closer to human milk in its composition and much more digestible than pasteurized cow dairy. There’s no rule that children must be drinking a white beverage at every meal, so she can get protein and calcium other ways. If it’s just to put some milk in oatmeal or cereal, I would suggest almond milk or hemp milk. 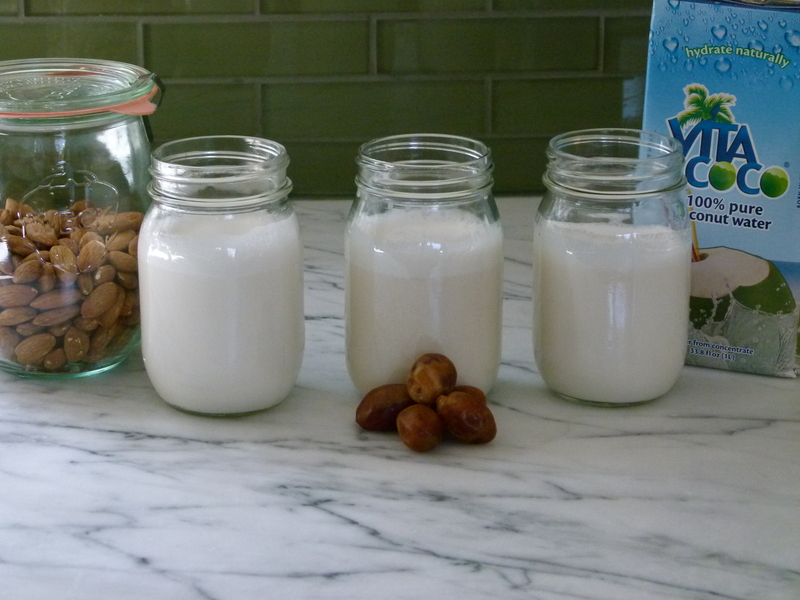 I love the idea of making almond milk with coconut water! Thanks for sharing. Even for the traditional almond/water version there is no comparison to the store bought versions. You are going to loooove it! I had a quick question about the Almond Milk recipe. After straining it thru the sieve or cheesecloth, does it have to be refrigerated for 4 days or is it good up to 4 days refrigerated? Not a silly question at all! You can drink the almond milk as soon as you strain it. It will stay fresh in the refrigerator for up to 4 days. Enjoy! The coconut almond is my favorite. It is really tasty, I agree. Kind of hard to go back to plain old almond milk once you’ve had the coconut version.